"As dry leaves that before the wild hurricane fly, when they meet with an obstacle mount to the sky." 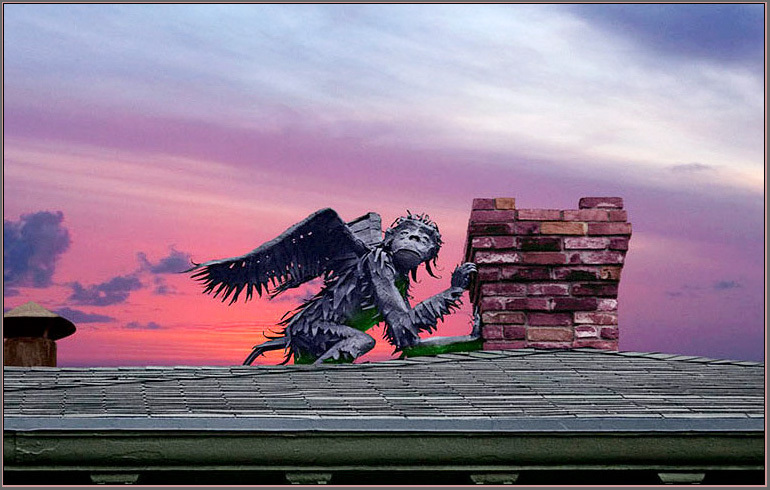 The first winged monkey appeared in Burlington, Vermont in 1975, sculpted into the roof line of an historic old building on the corner of Bank and St. Paul Streets. The sculpture was commissioned for a store called Emerald City of Oz. Emerald City was a waterbed store and a politically motivated gift boutique. This first creature was positioned so that he begged discovery, crouched, ever vigilant, always on guard, and softly bathed in green light. An icon was born. His mate emerged from the primordial soup behind a slate turret on the south side of the same building. These two mythical creatures were sculpted in steel by Steve Larrabee (1950 - 2011). For the better part of ten years, they stood their post in downtown Burlington. Businesses changed hands, addresses changed and Burlington's winged monkeys, threatened by zealots, flew south for a two year hiatus, mounted on giant rocks, deep in the forest. Emerald City reopened in 1988 and the winged monkeys landed on Shelburne Road, on the southern edge of town. It was here that tragedy struck. In September, 1992, the original sentry was ripped from his post by thoughtless and foolish hooligans. He was kidnapped and held against his will in a mysterious cell, parts unknown. He was gone. A pall fell across the land. The search was intense, but leads turned up empty, and the trail grew cold. After 6 months, his replacement was conceived in the workshop of sculptor Larrabee. A ‘Crimestopper’s Tip’ in May of 1993 instigated an undercover stakeout and the South Burlington Police Department caught the kidnappers in a botched transfer. After three days in a police locker, the proud creature, battered and beaten, was returned to his anxious guardians and his ever attentive mate. Literally days after the homecoming, his replacement arrived. This glorious new creature was sculpted in copper, wings back, in heat, baying at the moon. Her little fingers grasped the edge of the gable roof as she seized her haunt and screamed in silent delight. She was a blue species, and now, with diversity, there were three. In 1996 the original pair, flew to the clock tower that was once Union Station and is now the ever vibrant Main Street Landing. The copper goddess with the silent scream landed on the edge of a wood, amidst a patch of wild blackberries in the city’s north end. Once again, the better part of a decade passed. In the winter of 04/05 magic filled the air, and the guardians of the clock tower were with child. Lo. In August, Mama monkey delivered twins, a boy and a girl. The proud male, ever more vigilant, seized a flag and regained his watch on the clock tower of Main Street Landing. They built a nursery on the back side of the station and sequestered the protective Mother with her children. The blue goddess flew to the waters edge and trumpets from the theatre on the lake. Her clarion call, while but a whisper to us, pierces the primeval veil and lures a rogue male, blue too, what were the odds? From beyond the veil, he lands on the cupula above the Theatre, where he lures his siren sweet. For now,... as has been,... in the dark of night, and in the blink of an eye, the flying monkeys of Burlington, Vermont soar over the mountains, glide over the lake and serve as our mythical protectors. For indeed they do. Fantasy is real. Ask a child. Ask any child. These creatures of the sky keep us forever young. © rik carlson, boystoystoo.com, monkeyswithwings.com All rights reserved.